Clint graduated from The University of Sydney in 2011 with a Master of Physiotherapy; prior to this he completed a Bachelor of Science (Exercise Science) from the University of Wollongong. He joined the Beachside team after graduating, and became a partner in the business shortly after. Since graduating Clint has completed several post graduate courses including- Spinal Level 1, Sport Level 1, Watson Headache Level 1 and 2, Lyn Watson Shoulder course, Certificate in Spinal Manual Therapy, The Thoracic Spine in Sport, Dry Needling and McConell Knee course. Special interests include treating the shoulder and headache/migraine as well as lower limb biomechanical faults. Outside of Physio Clint loves spending time with his wife and 3 kids (Jack, Sophie & Olivia) and is a golf tragic, currently playing off a handicap of 4 at Cronulla Golf Club. Fabrice worked in hospitals for several years (Orthopaedics, Neurology, Paediatrics and Intensive Care) before focusing his interest in private practice and sports injuries. He has worked in numerous private practices throughout NSW and Victoria. He worked with NSW Country Rugby Union and NSW Triathlon clubs. 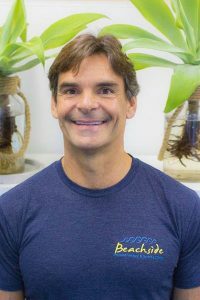 He settled in Cronulla and set up Beachside Physiotherapy and Sports Clinic in 1995. Since then, he was involved with local soccer, softball and netball sports teams and the rehabilitation of their members. He has completed numerous professional development courses such as Level 1 & Level 2 Sports Courses, APA endorsed Acupuncture course, The Thoracic Spine, McConnell Knee course, Diagnostic Ultrasound Course for Core Stability. Fabrice takes a particular interest in spinal conditions and rehabilitation, sports injury management and any form of post surgical rehabilitation, as well as headache treatment, back problems in pregnancy and also bio-mechanical and postural dysfunctions. 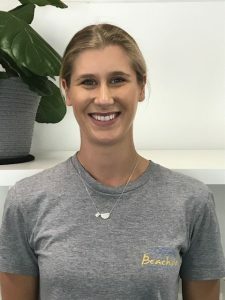 Emily graduated from The Australian Catholic University with a Bachelor of Physiotherapy and is our most recent addition to the Beachside Physiotherapy family. Emily takes particular interest in treatment of shoulders, sports injuries in children and teenagers and physiotherapy with the elderly. Emily has completed several postgraduate courses including clinical Pilates for physiotherapists and musculoskeletal segmental and dry needling. Outside of Physiotherapy Emily enjoys keeping fit and active through her interests in Surf Lifesaving and also plays competitive Australian Rules Football.